From our Unique Series this is our Double/Companion genuine marble cremation urn available in white marble. It has a large capacity fit for 2 adults or one adult and extra items like your loved ones favorite mementos or jewelry. 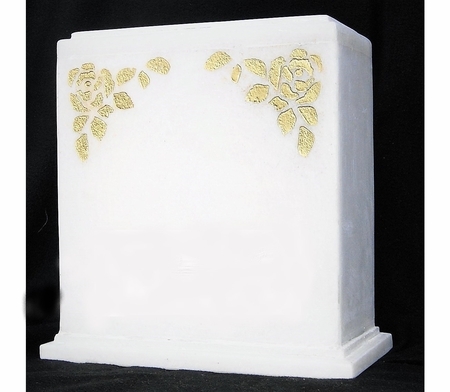 The urn has beautiful gold leaf ivy carved into the upper corners on the front.This urn has with a clean and elegant shape and is honed from genuine marble. The beveled top and bottom create a classic appearance.